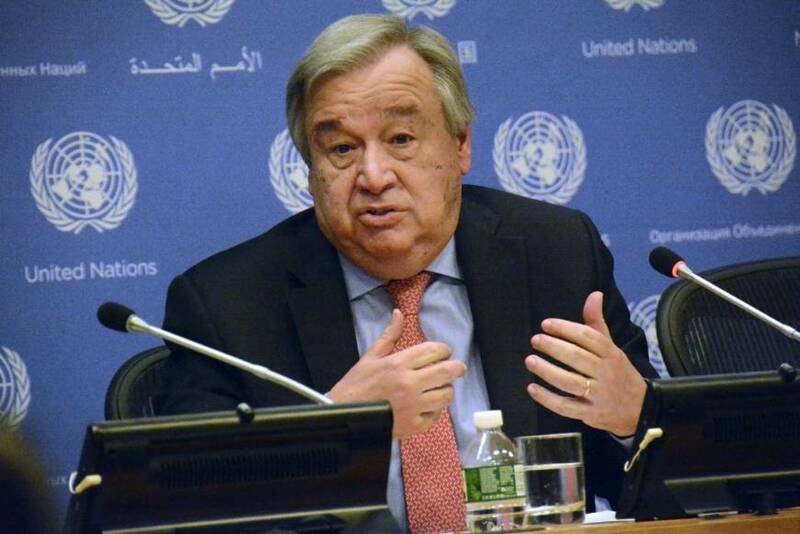 NEW YORK/HIROSHIMA - U.N. Secretary General Antonio Guterres will travel to Nagasaki to attend the annual ceremony marking the atomic bombing of the city, the United Nations said Tuesday. 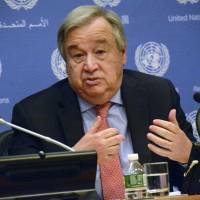 It will be the first time for a U.N. secretary-general to attend the Aug. 9 anniversary. In 2010, Guterres’ predecessor, Ban Ki-moon, became the first U.N. chief to attend the event commemorating the Hiroshima atomic bombing. Nagasaki was the second city to be targeted in 1945, only three days after Hiroshima. The atomic bombings took place late in World War II and heralded the start of the nuclear age. Alongside his Hiroshima visit, Ban traveled to Nagasaki in 2010, laying a wreath at the memorial site before the actual ceremony. He warned that some 15,000 nuclear weapons remain stockpiled around the world, with hundreds of them prepared for launch at a moment’s notice. “We owe this to the hibakusha — the survivors of nuclear war — and to our planet,” he said. The visit will also come a little more than a year after the Treaty on the Prohibition of Nuclear Weapons was adopted on July 7, 2017. The nuclear ban treaty was passed with support from 122 U.N. members, but without backing from Japan or any of the major nuclear powers that constitute the five permanent members of the U.N. Security Council — Britain, China, France, Russia and the United States. Also on Wednesday, Hiroshima Mayor Kazumi Matsui said he plans to express concern over the re-emergence of Cold War-era tensions when he delivers his peace declaration to mark the 73rd anniversary of the bombing of the city. Amid a growing tendency in the world to put national interests first, Matsui said he plans to express caution that this could create tensions reminiscent of the Cold War, a period overshadowed by mounting fears of nuclear conflict. The mayor unveiled the gist of this year’s peace declaration, which he will make next Monday at the memorial ceremony. Since North Korea has agreed to work toward denuclearization of the Korean Peninsula, he intends to highlight society’s true hopes for a further easing of tensions on the peninsula. Regarding the nuclear ban treaty, Matsui will call for efforts to make it a “milestone” in realizing a world without nuclear weapons. Japan, having relied on U.S. nuclear deterrence for its security in the postwar era, did not sign the treaty. In the declaration, he will also urge the Japanese government to play a role so that the international community works toward the abolition of nuclear weapons through dialogue and coordination, according to the released gist.